Product information "freeUSBi - complete kit"
Programming adaptor freeUSBi required for programming the freeDSP Classic SMD B board and other units from the freeDSP project. 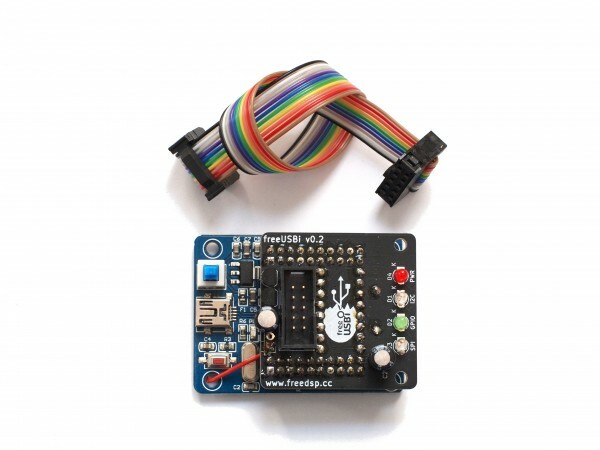 The offer includes the fully assembled programmer with the cypress USB interface, the programmer PCB to connect the DSP board and a 10pin cable. The board is connected to the PC via mini-USB and to the freeDSP board with the included cable. No additional power supply is required as the board provides power to the DSP board during programming. Both programming at run time as well as permanent programming of the EEPROM is possible. Related links to "freeUSBi - complete kit"
Subscribe to the free newsletter and ensure that you will no longer miss any offers or news of even elements Shop.